Taipei, Taiwan, Aug 23rd, 2011 – Elitegroup Computer Systems (ECS), the world’s leading motherboard, graphics card, barebone system, notebook and mobile device manufacturer presents its All-In-One (AIO) system—G11 to delight the market and enrich digital life. As Intel’s strategic business partner, ECS G11 has been designed in the Thin Mini-ITX form factor complying with Intel’s AIO system standard specification. ECS G11 is capable of being upgraded easily with devices or motherboards under the standard specification which gives the end user the entertainment of a Do-It-Yourself (DIY) system. G11 is equipped with a 21.5” wide LED touch panel supporting 10-finger multi-touch (optional) with up to 1920 x 1080 (Full HD) resolution for a responsive interactive experience. Moreover, ECS G11 adopts the Intel® H61 chipset, supporting the latest Intel® 2nd Generation Core™ processors to extend the possibility of powerful performance. Easy to touch and operate, ECS G11 is an ideal platform for a home entertainment system. Furthermore, with strong upgradability and extendibility, ECS G11 can be a powerful working PC for every kind of task at the office. ECS G11 has no limits of application. 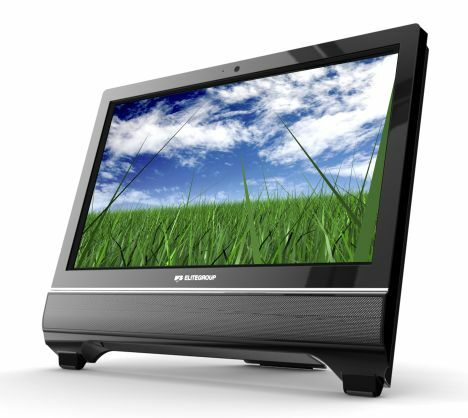 With a multi-touch panel (optional), G11 can also be a digital board or educational whiteboard. ECS G11 is the all-new customizable AIO system that meets the needs of next generation desktop computing. Experience the new generation of whitebox All-In-One (AIO) solution. ECS will also present an AIO system with a 24” LED panel in the near future. Stay tuned.